It's amazing how much of a difference the details make and using wedding accessories really can make your day very personal. I've been adding accessories into peoples' wedding flowers for many years but it has become an increasingly popular trend lately. Using accessories is a perfect way to make your wedding flowers unique and individual. You might think that the tiny details may not get seen but it's amazing what people notice and how much of a difference paying attention to the detail can make. Many brides call it my little bit of 'bling'. You can use diamantes in a very discrete and delicate way or go for a more elaborate sparkly look. It's all about how much you use and what size of diamantes you choose. This detailing is the eye-catching sparkle on a sunny day that catches the light or a fabulous way to compliment crystal beading of your dress. Don't forget the gents, just make sure you clear it with them first! 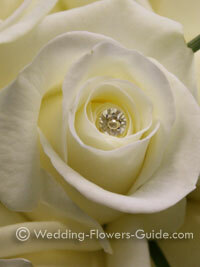 If you're having diamante detailing in your bouquet why not add a little to coordinate with the groom's buttonhole. Discover more information on how to enhance your wedding flowers with crystals. Butterflies have become a really popular wedding theme and a perfect accessory to run through into your wedding flowers. They are very effective when added to the table centrepieces. Afterall, l butterflies hovering over a beautiful fragrant flower is a natural summer sight. I'm always amazed at the choice of butterflies available and have enjoyed selecting different sizes and colours to fit in with a wide range of looks. Size can also make a difference. You can decide if you want them to play a small role and only just be seen or if you want to go for a much larger prominent feature. 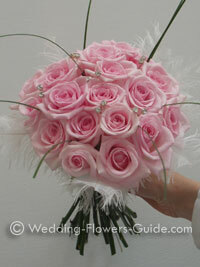 The beautiful soft delicate structure of feathers makes a truly romantic accessory to wedding flowers. 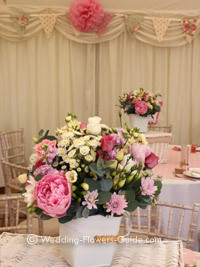 They can be added as a collar surrounding your bridal flowers as show here. You can also use them in the bridesmaid's bouquets and they are certainly a hit in the young flower girl wands. Feathers can also be incorporated into your table centerpieces following the theme right through all of your wedding flowers. A very popular recent trend is the vintage look, lots of brides are going back to the romantic nostalgic look and vintage sums that up perfectly. You can create a vintage look through your choice of old-fashioned fragrant flowers or by the use of accessories. When I'm working with brides to create a vintage look to their wedding flowers I often suggest that we incorporate flowers of different sizes and textures. This will often give us the perfect look for vintage. One of the most popular flower choices for vintage is the rose, we also tend to incorporate foliages into the bouquets and there is nothing more fragrant and vintage looking than eucalyptus. You can see roses, eucalyptus and peonies in this low centerpiece (above) that I created for a recent vintage themed wedding reception. The most popular vintage accessories include the use of dimante-studded brooches and pearls. See some more of our recent vintage style wedding ideas.